BD only manufactures products with the finest surgical steel available. The BD Ultra-Fine™ Short Pen Needle is 31 gauge, 8 mm (5/16"). 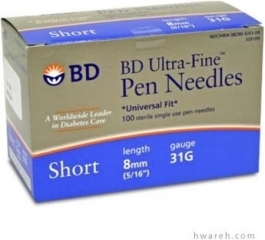 The BD Ultra-Fine™ Short Pen Needle offers BD's thinnest inner diameter, where the majority of people who take insulin get effective results from this needle.